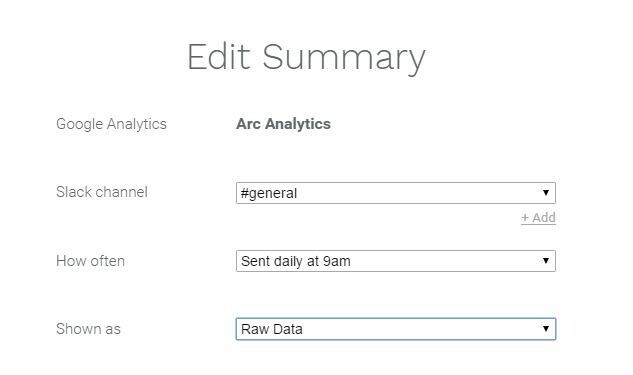 We built Arc to reduce information overload from your analytics. Graphs and numbers are powerful, but without context they’re difficult to unravel. 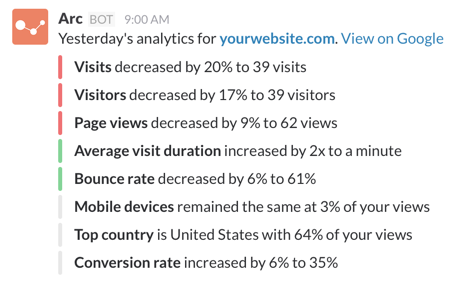 This is why Arc summarizes data to give you a quick glance at how your site is performing every day. This is a peek into your analytics and the start of Arc’s journey into providing valuable insights without forcing you to dig into tons of extra details. But what if all that data isn’t overloading you? What if you want it? Arc now ensures you have all the raw data you need right at your fingertips. All you need to do is visit your Arc dashboard and select raw data for any of your summaries. Simple. It sounds great, but raw data comes with some problems. On top of information overload, raw data doesn’t offer any context to compare against. If you’re ok with that, we’re still giving you clear sentences that are easy for everyone to understand and now we’re also giving you more data every day so you can use all your existing analysis tools. Raw data is setting the stage for something that we’ve wanted for a long time. Soon, daily summaries will become daily insights. Each day you’ll receive a different nugget of information that will spark discussions between your team and help you understand how people interact with your website. We think this is incredibly exciting and useful, but you can always fall back on the raw data if that’s more your thing. So that’s how Arc can add raw data to your summaries! Another small change with a big impact 👊. I say this every post, but we really take feedback seriously! Every feature we’ve released has started as a request from you. So, reach out with questions or suggestions! We’d love to hear from you. Email hello@arc.ai or use the /arc-feedback command inside slack! Originally published at blog.unioncode.com on November 27, 2016.